LACMA Sacque - Done! And I Love It! Sometimes it's really does pay off to just press through the rough patches and finish a costume, even if you hate every stitch along the way. I'm glad I finished this one. I spent a lot of time fixing mistakes (and some I had to just live with). This gown is by no means constructed how it should be, but after all has been said and done, it does fit me, and it looks pretty darn good! 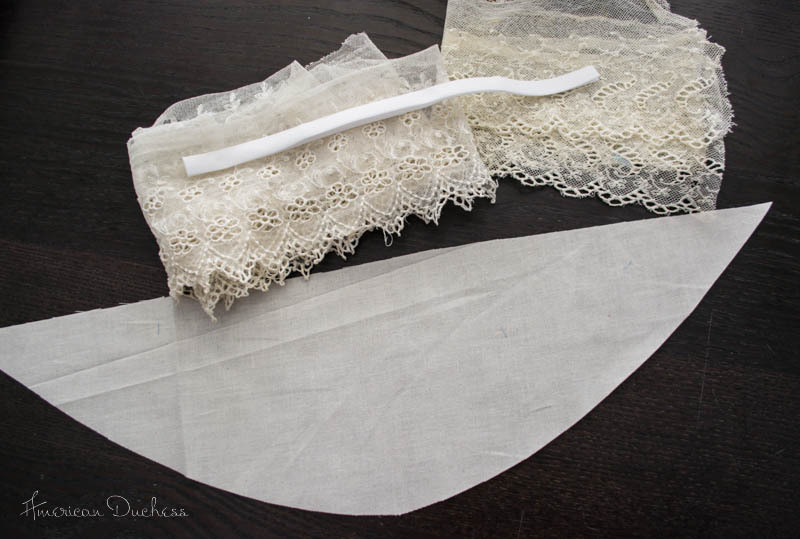 The bottom tier of lace was mounted on the edge of this crescent-shaped piece of muslin. 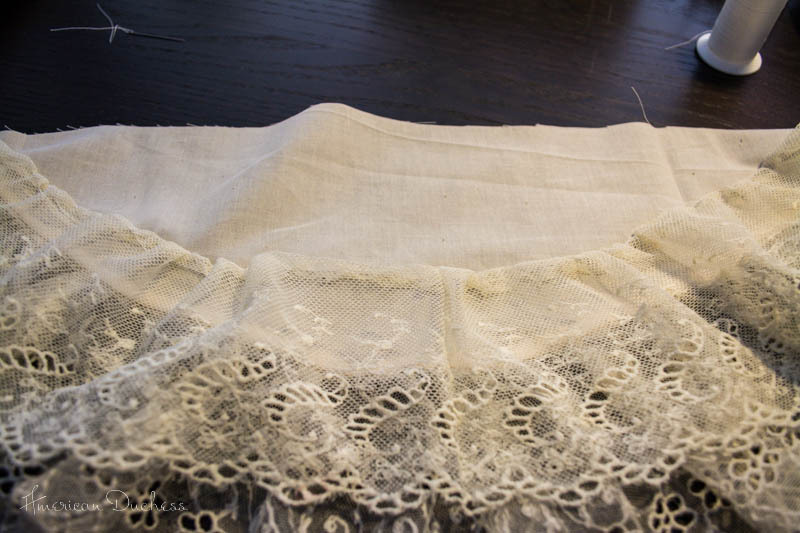 The second tier of lace just above it, and overlapping, the the straight top edge of the muslin was gathered into the band. The finished engageantes are independent of the gown - they're just tacked in and can be removed to be used on other gowns in the future. In my last post, the sleeves were too tight, and made my arms look like sausages. 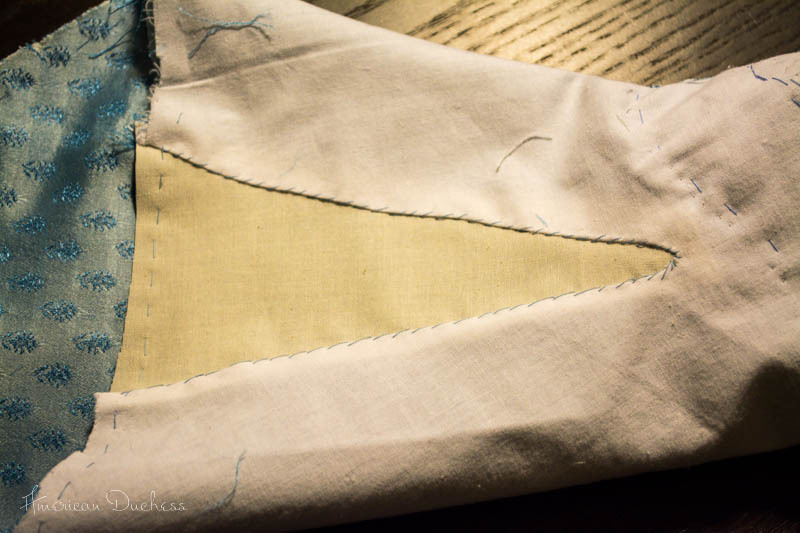 I had constructed the sleeves incorrectly, using a sleeve pattern with a front seam, from an Anglaise, and set them with a later method as well. All this made me particularly unhappy with this part of the gown, so I ripped the sleeves off, and cut some rather large gussets in. The large gusset set in by hand, under each arm. HUGE difference in fit and look, and you can't see it at all when the dress is on. Re-setting was tricky, but came out pretty okay. They look at least a little more like they're supposed to, and most importantly they fit nice and loose. 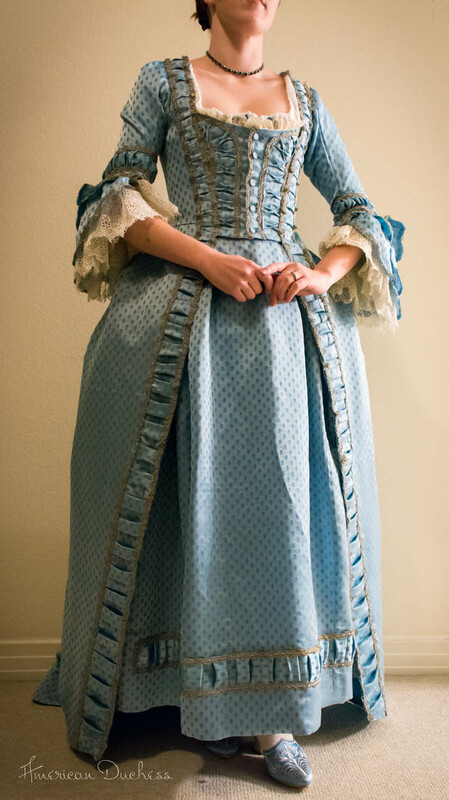 There are still some things I can add to this dress to take it even further - bows on the sleeves, and a flounce on the petticoat. 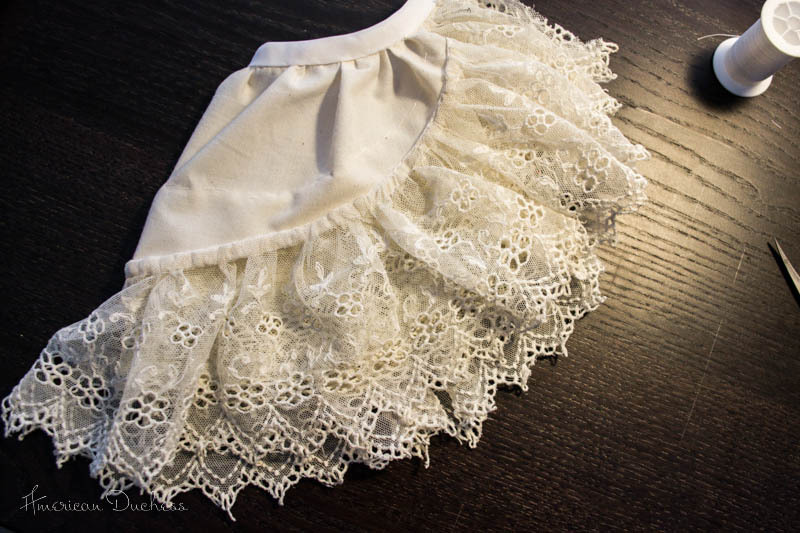 I have just barely enough fabric left to make a self-fabric flounce (if I piece it), or I might continue to quest on Etsy for the perfect piece of silver net lace that won't break the bank. For today, though, and for the photo shoot on Wednesday, this piece is done! That turned out absolutely stunning!! Super pretty!! And hey, a gusset is period! It looks gorgeous! Isn't it an amazing feeling that you get when you've finished a complex project that you thought you'd never make it through? You did a fantastic job! Very pretty, I love that fabric! It looks gorgeous! I can't wait to see the pictures from the photo shoot. You did a fantastic job. And those gussets under the arm? Totally a period solution to having cut it too small. There are all kinds of examples. You were just trying to be more authentic. Thanks! I am thankful for the gussets. 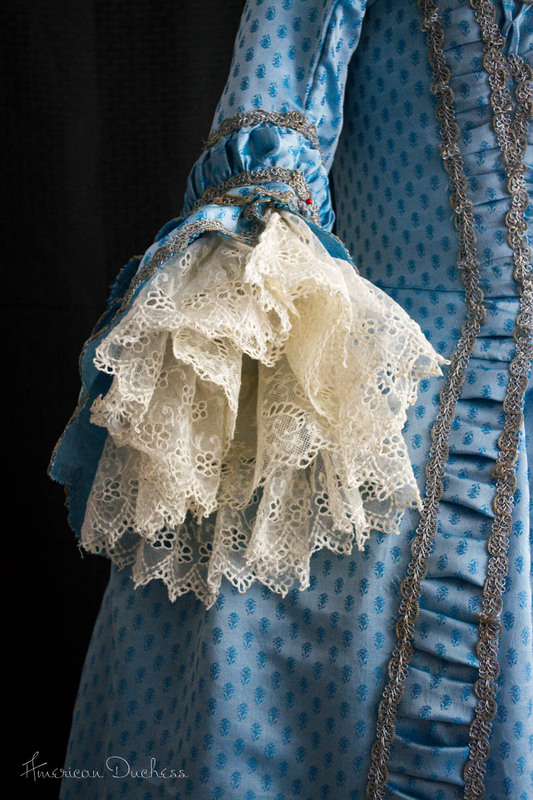 If you ever get to the Marjorie Russel out in Carson, the yellow 18th c. dress they have there has some gussets under the arms. They're not as big as these, but same idea. 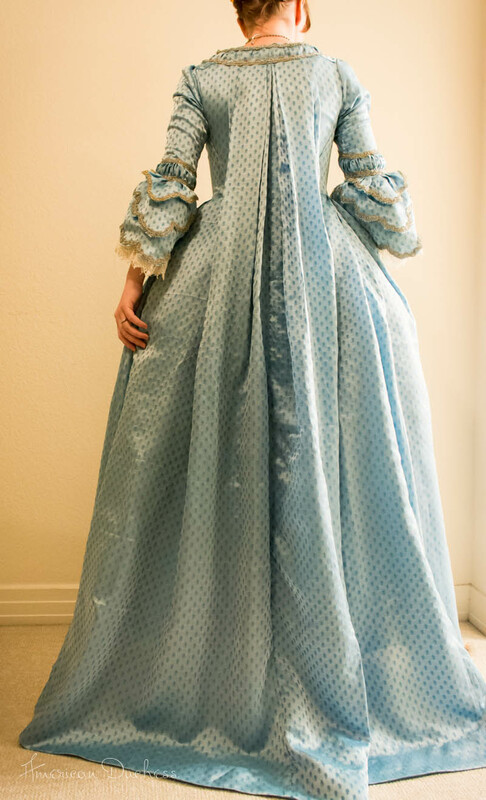 It's a cool gown, and a cool collection, if you are in need of costume research. That color is amazing! You look wonderful. It's gorgeous!! I can't wait to see the photos from Wednesday. Gorgeous! Well done! Sometimes you do just have to barrel through to the end; and sometimes these end up being the projects we're proudest of, even if they're not perfect. Hi Lauren, I haven't posted here before, but I follow your blog with interest. 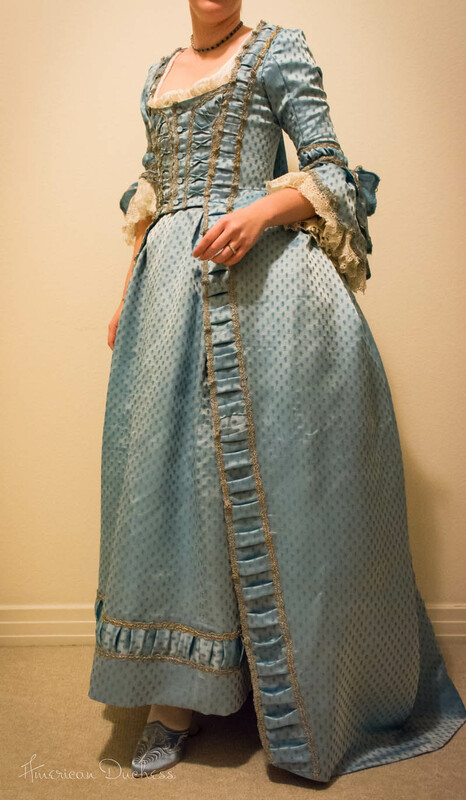 I am not a costumer but I adore the fashions from bygone eras and I am fascinated by the way you faithfully recreate them. I think this gown is your best yet! It looks like it belongs in the MET. Well done! That's a gorgeous work !!!! It is beautiful. And the shoes are perfect. I second every compliment!! We all are so happy you persevered because the result is (as expected) absolutely AMAZING! !